It is the summer for sweet potatoes! 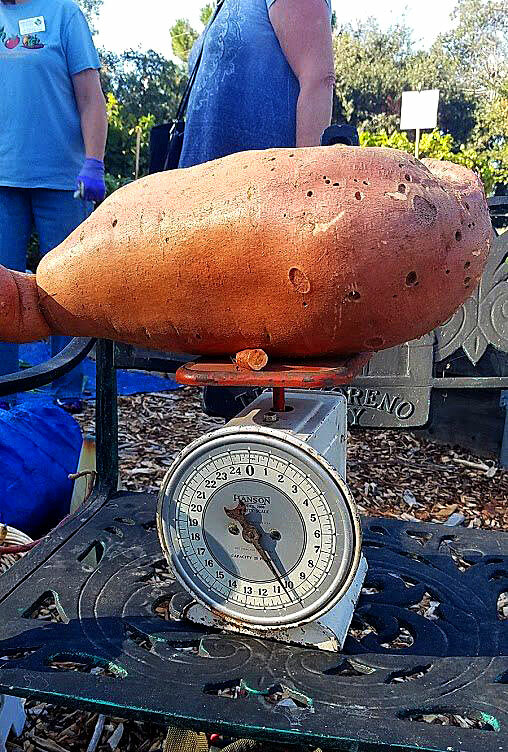 In 2014, we grew our first sweet potatoes in one of the raised beds in the Fair Oaks Horticulture Center vegetable garden. The plants were easy to grow and the harvest was very good. So, when ideas were being tossed around for what to grow in the straw bales in 2018, sweet potatoes quickly rose to the top of the list. 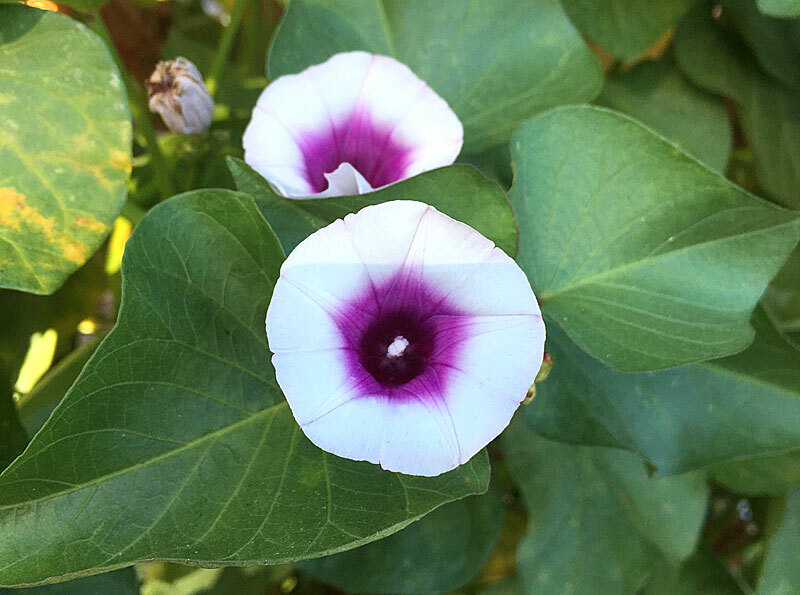 Because sweet potatoes are a type of morning glory, they are vines that grow well on a trellis. 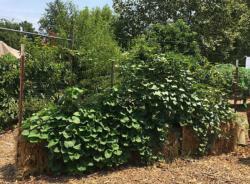 Since we have a trellis installed at the straw bales, sweet potatoes became an obvious choice. Every year since 2013, when we first started experimenting with growing vegetables in straw bales, a summary has been prepared and is posted on our website. For information about straw bale gardening, including how to condition the bales, irrigation, fertilization, and other items of interest, please read the articles from previous years, as well as Garden Note #160, Straw Bale Gardening (PDF). 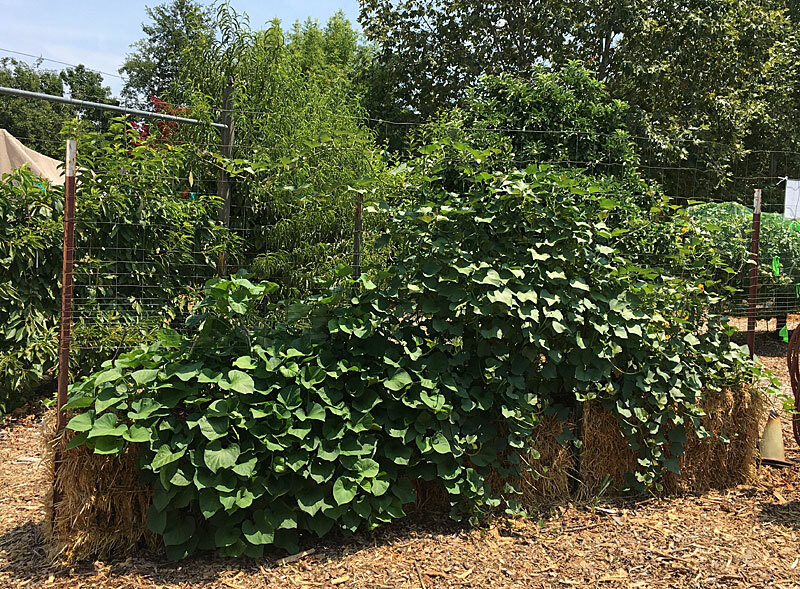 For detailed information about growing sweet potatoes, see Environmental Horticulture Note #102, Growing Sweet Potatoes in the Sacramento Area (PDF). In mid-April, 'Beauregard' and 'Nancy Hall' sweet potato slips (six slips of each variety) were received from the grower (a farm in Tennessee that was certified to ship sweet potato slips to California). It is important to note that the California Department of Food and Agriculture has established a quarantine against the sweet potato weevil and all parts of sweet potatoes (tubers and plants/slips). The quarantine currently includes nine southern states and Hawaii, so slips grown in those states are prohibited from being shipped to California unless the grower receives a certificate issued by an authorized agricultural official indicating that the shipment originated in a non-infested area. Since the straw bales were in the process of being conditioned and not ready for planting, the slips were planted into potting soil in six-packs until ready for planting into the bales. The slips were transplanted into three bales of wheat straw in early May. By early September, the foliage on the plants had not yet turned yellow and started to die back, which are signs that the sweet potatoes are ready for harvest. It was a bit perplexing, since the estimated number of days until harvest (Beauregard, 80-90 days; Nancy Hall, 110 days) had long passed. To force the plants to die back, the irrigation to the straw bales was turned off. Approximately three weeks later, the now-faded foliage was removed in anticipation of harvesting in early October. The sweet potatoes were harvested on October 3 and during our October 10 Open Garden public event. The total harvest from 12 plants was a little over 57 pounds, with Beauregard making up most of the harvest. The Beauregard harvest also produced a whopper (“Taterzilla”) that weighed in at 10½ pounds! Sweet potatoes did very well in straw bales. The biggest obstacle to growing them is that it is often difficult to find a grower that can ship sweet potato slips to California due to quarantine restrictions. Sometimes slips are available at local nurseries, but EHN #102 (PDF) includes a few sources of certified pest-free slips that, at the current time, can be shipped to California.